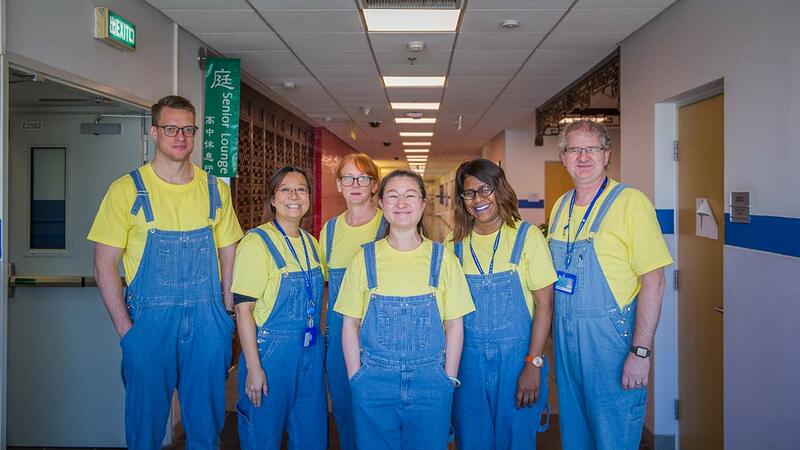 International School of Beijing News: Community, action! With every point scored in the Great Wall Shootout basketball tournament last week, the International School of Beijing (ISB) erupted with excitement. With every shot for glory, the whole school held its breath. With every final buzzer, winners and runners-up were congratulated and cheered by an entire community of students, teachers, parents, and visitors. It was exactly what Eileen Rueth, ISB's new High School Student Life Coordinator, had in mind when she proposed that the High School finish classes early to watch the opening matches on Thursday and Friday. The reorganization ensured huge crowds at the invitational Asian tournament, an electric atmosphere, and a real sense of togetherness. Founded by then ISB teacher Tim Callahan 16 years ago, the Great Wall Shootout has become an annual ISB highlight. It is staged at the end of High School Spirit week, a community-building initiative common in North American schools. Ms. Rueth identified the week as one of a number of rallying points when the whole of ISB could come together, have fun and be united behind a single cause. Her Student Life Coordinator role was drawn up to help foster a sense of community and strengthen student social-emotional well-being. It supports ISB's Whole Child approach, which values young learners' health and integrity along with their academic performance. The school believes that successful students are not defined solely by their attainment in tests and exams, but also by their character, empathy, and sense of teamwork. Working closely with the High School Student Council (STUCO), Ms. Rueth has been busy perfecting events like the Shootout and Spirit Week. Students voted on Spirit themes and activities and whipped up excitement through their social media accounts. 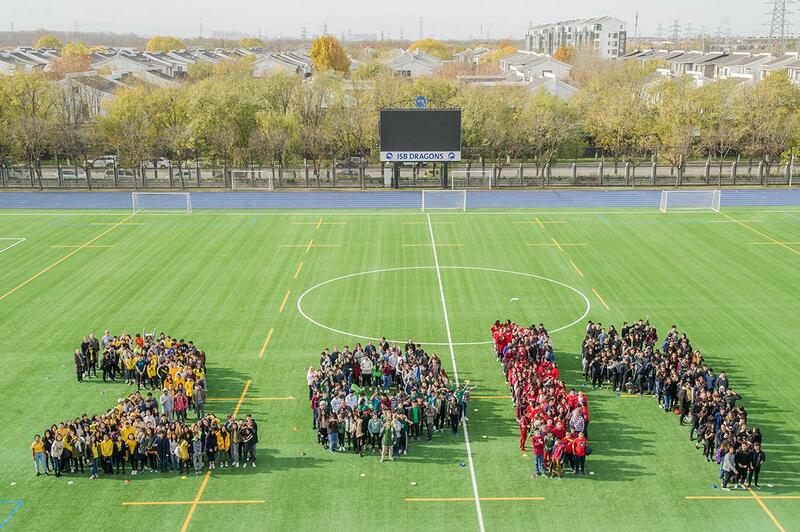 There was a lemonade drinking competition, quiz bowl, fancy dress, face painting, and an aerial group photo in which students arranged themselves in formation to read "2019." Of course, the ISB community isn't limited to students and staff. 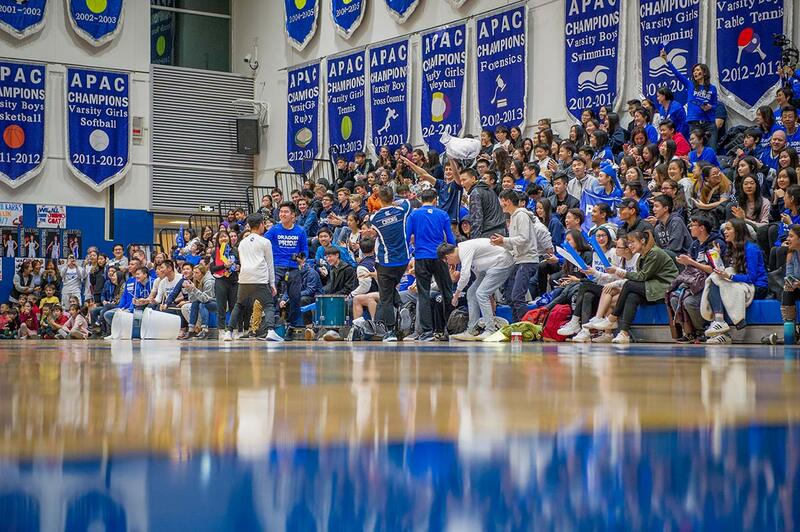 Families thronged the bleachers for the Shootout, and alumni parents were invited to a reception and to take part in a free throw competition during halftime on Friday. Competing teams from Concordia International School Shanghai, Seoul Foreign School, Hong Kong's Sha Tin College, Dulwich College Beijing, and Western Academy of Beijing enjoyed the school's hospitality. "We want to build the idea that ISB should be an important part of your life. We're trying to ensure it is memorable. Culturally, Spirit Weeks may not be a part of international students' idea of what school is, but they always surprise themselves by really liking it," said Ms. Rueth. "High school should be fun. This is an exciting way of supporting fellow students. It's too easy to get bogged down with academics. My job is to define our pastoral identity and to really carry forward social-emotional learning." Plans for more community-building events in the High School include a murder mystery dinner with the Thespian Club, a repeat of the hip-hop festival that was a hit last year, and the annual STUCO Blast, when the gym is opened for karaoke, dodgeball, and board games. Ms. Rueth's job is to fine-tune the organization of these occasions and coordinate between the various student clubs and groups that lead them. Since she was appointed, STUCO meetings have been moved from a private office to the MS/HS library for transparency and so people can drop in. After-school events have been better attended since she made sure they finish on time for students to catch buses home. Spreading community spirit still further, the Middle School is also celebrating its own Spirit Week from November 26 to 30. STUCO organized distribution of free thundersticks so students could make plenty of noise during the Shootout. "The Great Wall Shootout is a good way to get everybody out in their ISB merchandise supporting our teams," said STUCO's Sunny Lee. "Getting to college is the main focus for most students in High School. It is our job to make ISB more than that." The ISB girls team won the Great Wall Shootout, and the boys finished second. The strong sense of community around the basketball meant plenty of wins off the court too. To find out more about our Co-Curricular program, please click here.